Computers are everywhere. They not only help us communicate ideas and information to each other, they can also help us analyze various complicated pieces of data, enabling us to see patterns and make various predictions and adjustments. This can be especially helpful in the workplace. By using sophisticated applications and programs to review data, processes, and procedures, an owner can quickly troubleshoot issues that are just barely beginning to rise to the surface. 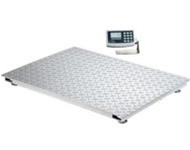 Arlyn Scales has been a leader in the weighing industry for the past thirty years. We are committed to building scales that are dependable, accurate, and technologically innovative. We do this by refining previously successful craftsmanship while experimenting with various computer and other technological advancements to see how they may be applied to current industry practices and future ones, as well. We manufacture our scales in our factory in Long Island, New York, which means we are able to ship factory direct to our customers, who don’t pay for middle tier markups. We are also able to invest some of those savings into our scales, which means our clients are purchasing a scale that our competition is not able to match, both in terms of quality and cost. USB Ð Short for Universal Serial Bus, this is a communication protocol that is found in almost all computers and devices that interface with computers. USB is the go to common denominator when people are looking to connect computers to outboard devices. Our scale indicators can be designed with a USB port, and with our USB Remote Software and a standard USB cable, you can connect your Windows based PC or laptop to your scale. This will enable you to view, on your computer’s screen, the scale indicator. You will also be able to issue commands to the scale via the computer interface software. Most importantly, you will be able to extract the weight data from the scale and move it onto your computer. Once the data is on your computer, you can analyze the data using MS Excel or MS Access. Ethernet/Wi-Fi Ð These combined options are very exciting. Whereas with the above USB option, you will either need to be in the same room with the scale or have a very long USB cable, the Ethernet/Wi-Fi options allow you to keep your workstation where it is and let you work with the scale either on your company’s local wired network or via a Wi-Fi network.Clearly, the advantages of our connectivity options are tremendous. If you are connected to your company’s network, you could conceivably have collaborative presentations where you will be able to show scale performance and change commands without ever having to move down into the industrial environment. Data crunching can be shown and shared with colleagues to begin project performance and productivity analysis. By using the Wi-Fi option, you will be able to access the scale 24 hours, 7 days a week from just about anywhere in the globe. Should you need to work from a remote location yet need to get weight data, you will be able to do this with our scales. This option can also help you mitigate risk should an issue develop outside of working hours. You will be able to troubleshoot from the privacy of your own home. USB Flash Drive Ð This is a great option while using the scale in the field or other remote location. In the event that the scale is not able to connect to a computer, you can simply insert a USB flash drive into the USB thumb drive port and begin downloading the weight data via the scale indicator controls. Once the data is safely on the flash drive, you’ll be able to remove the flash drive from the scale and connect it to a Windows based PC or laptop whenever it’s convenient for you. Make sure that when you extract the data to the computer that you open it with an application that can read Comma Separated Value (CSV) files. Additionally, there are other logic control devices that may help you use your scale including 4 Ð 20 ma, RS-232, and RS-485. Our optional setpoint controller can help you automate your process and increase productivity. The optional setpoint controller allows you to program up to eight weight values. Using this and optional solid state relays operated via a PLC (programmable logic controller), you can quickly begin to automate your batching, filling, and dispensing operations. For example, you could be mixing yellow and blue dyes into a white base to make green paint. By programming the controller to shut the filling pump off once the targeted weight of the yellow dye has been achieved, and then dispensing blue dye into the same container until another weight value has been reached, you can automate your paint color creation process. This will allow you to refine your paint recipe and begin to consistently ship out barrels of the exact same shade of paint, time after time. With your scale connected to your computer, you will be able to archive all the data to ensure that there is no variation in weight during productivity. Not having personnel around to make human errors will allow you to use your staff for more complicated tasks that require oversight and supervision. Rest assured, we believe that the human touch is important and that customer relationships should never be handled by machines. We employ a highly knowledgeable and well-trained customer support staff to help you determine what scale and computer options are right for you, and that you get them at a price that works with your budget. Should you be uncertain as to what you are looking for, or require some more tailor made modifications to our pre-existing designs, we’ll be happy to help. At Arlyn, our customers are the biggest priority. To learn more about our scales and the different connectivity options we provide, contact us today using the form on the Contact Us page of your website or by phone at (800) 645-4301.